Your 16th anniversary is surely a moment to celebrate and to throw a Sweet 16 party. Sophia's Style Boutique comes with an enchanting selection of Sweet 16 dresses. With our good collection of dresses you will make and cherish memories that last a lifetime. Dresses can have stylish, intricate details or a more casual, simple design, they can be short or long. Charm and beauty define this timeless style by Cinderella Couture. Shimmery dress by Angels Garment will make young ladies shine and have a good time. Carefully chosen fabrics and embellishments add up to this gorgeous piece by Cinderella Couture. A truly special dress for your princess by designer Kids Dream. Follow your dreams with this Cinderella Couture special occasion dress. 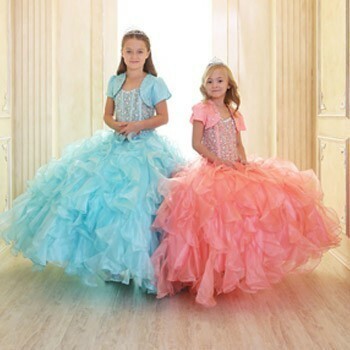 An adorable dress to convey a vibrant sense of fun and entertainment from Cinderella Couture. There is only one day that special day you turn 16 and that is why you it to be fabulous, you want to throw a fabulous party to celebrate the event and have fun. You can have a themed party at your 16 th anniversary. In this case you should choose an appropriate dress to match the idea and the theme of the party. You can also have a regular party and have a great time with friends and other guests. Enjoy our great selection of Sweet 16 dresses online at SophiasStyle and take advantage of our discount prices.